Texas State Capitol Building in Austin Texas. I have been politically active all of my life, but this was a first for me. I have decided to share my thoughts and impressions of a very exciting day. who planned this serious trip to Austin to meet our state leadership and made the trip a huge success. Forty-four determined citizen Lobbyist gathered early in the morning last Wednesday at a church in Southlake Texas. We boarded a chartered bus to ride together to go to Austin. Our goal, to participate to engage in and influence our elected officials. This was our kick-off event. Imagine 44 dedicated Patriots arrived on time (at 5 a.m. in the morning)! The first thing we all did was to hand in our signed Code Of Conduct to be a citizen Lobbyist representing NETTP. As soon as we were rolling we reviewed the Citizen Lobbyist Guidelines and Training Course that had been prepared and emailed to all of us. Our goals and trip are based on this list of NE Tarrant Tea party Citizen Lobbyist Guidelines for the 83rd Session of the Texas House and Senate. It is about a three hour drive to Austin, and with traffic it can take longer. Quiet conversations floated in the air between congenial patriots during our ride to Austin. They were filled with patriotism, and it was obvious that our group was not only well informed, but ready willing and determined to make a difference. The State of Texas has a unique system of governance. The Texas Legislature meets in regular session for 140 days in every odd-numbered year, in accordance with the Texas Constitution. 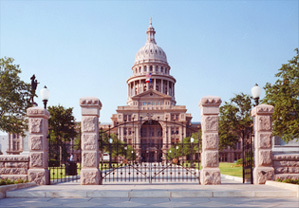 The Framers of the Texas Constitution had a vision of a 'citizen legislature' who would adhere to the principle of limited government, meeting for a short period, in order to pass a 2-year budget, consider legislative revisions and new laws, then to return home to their districts to live and work under the laws they have passed. The governor has authority to call the Legislature into 'special session' which can last only 30 days, and during that time only items specified by the Governor may be considered in the special session. We arrived in Austin and debarked from our bus and immediately entered the Capitol. Our first stop was to our local State Representatives offices where a much appreciated breakfast and warm welcome was provided by Giovanni Caprigilione, State Representative District 98, Jonathan Stickland State Representative District 92, Matt Krause, State Representative District 93, and Stephanie Klick, State Representative District 91 (who was not able to join with us due to Committee duties). that is me to his left! Immediately following a meet and greet with our State Representatives and their staffs, we went directly to a planned meeting with Lieutenant Governor David Dewhurst and his staff. Lt. Gov Dewhurst talk highlighted the success of Texas under Governor Perry's leadership, their position on Obamacare (against it) 2nd Amendment Rights (will defend them) and their goals for this legislative session. Our group engaged in a spirited question and answer round on Toll Roads and privatization of Texas Roads with Lt. Gov Dewhurst. Our meeting with Lt. Gov. Dewhurst lasted a bit longer than an hour. He was generous with his time and was happy to shake hands with all of us, patient about having many pictures taken and invited us to watch the "Black-White Ball Re-Election Drawing" that determines which State Senators will have to run for re-election determined by who draws a white or black ball during the next election cycle. The list of which Senators drew either a two year or four year term can be found here. This rare event is held every ten years after redistricting. Some Senators will face an election in two years and others will serve a four year term. Part of our group went to the Senate chamber to witness this event, (which was added to our schedule) and others went to the House Chamber. After either visiting the house chamber or Senate Chamber we broke and enjoyed lunch in the cafeteria. We met an hour later outside of our Representatives offices for team assignments and 16 teams fanned out across the State Capitol to meet the Staffs of State Representatives and State Senators to introduce ourselves share NETTP's Legislative Agenda and to collect business cards of the staff. Our teams visited 76 Legislators. Following our success of visiting 76 elected officials our group gathered outside at 3:00 p.m. at the Western Entrance to the Capitol to hear Senator Dan Patrick, District 7 discuss the issues of education his goals to improve the education of Texas children, how to address failing schools and legislation he is working on to address challenges in education Texas faces. He also generously gave our group nearly an hour of his time as he shared his thoughts and goals for this legislative session. Immediately after our meeting with Senator Patrick we were taken on a tour o the Capitol building and grounds. It is beautiful and impressive. Filled with great art and statues and lovely antique furniture and of course reminders of Texas History. Our next stop was a meeting with Texas Land Commissioner Jerry Patterson, whose offices were at least 3 blocks away. Sadly I must admit at this point I was so tired that I along with about 10 others elected to wait at the Capitol while the rest of our group met with Land Commissioner Patterson. When the meeting with Land Commissioner Patterson ended our group assembled and boarded our bus to head home to greater Dallas Fort Worth. On the way home, we were treated with a viewing of "Run Away Slave" . We stopped in temple for dinner and we arrived back to Southlake at about 9:30, where we said our good-byes and climbed into our vehicles to drive home. If your Tea Party is not engaged in this type of citizen outreach to your local elected state representation I highly recommend that they consider modeling Northeast Tarrant Tea Party's Citizen Lobbyists Program. 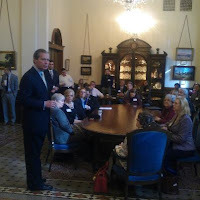 I would like to once again congratulate NE Tarrant Tea Party members and leadership. I would like to thank them for their dedication and effort to make our communities, Texas and the United States a 'more Perfect Union'. Our United States 'Seat of Government' is not a three legged stool as some politicians and those in the press often say, it is a Chair. We the people are the fourth leg of that chair and it will not function as our founders envisioned without our relentless participation. So I ask you my faithful readers what have you done to make a difference today? Join your local Tea Party get informed, become engaged, be involved. Participate in your governance. It is both your duty obligation and right as a citizen.